CAN BE STEADY COLORS OF RED, GREEN, BLUE OR WHITE OR WILL CHANGE COLORS. CONSISTS OF A 6' WOOD BANQUET TABLE, 2 LIGHTS AND A 72" WHITE SPANDEX TABLE COVER. 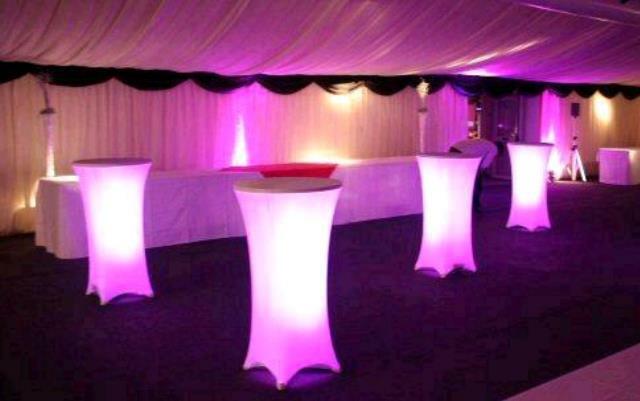 CONSISTS OF A 36" COCKTAIL TABLE, 1 LIGHT AND A 36" WHITE SPANDEX TABLE COVER. * Please call us with any questions about our light up tables rentals in Cleveland, Parma, North Ridgeville, Strongsville, and Cuyahoga County.